Several Palestinians were kidnapped by the Israeli occupation forces (IOF) at daybreak Tuesday in an abduction sweep rocking the West Bank. The Israeli army claimed responsibility for the abduction of 11 Palestinians at predawn time on allegations of their involvement in anti-occupation activities and protests. The IOF stormed Kafr al-Lubad town, in Tulkarem, and kidnapped the girl Alaa Fukaha from her family’s home. The campaign also targeted a Palestinian civilian from Nahaleen town, west of Bethlehem, a young man from Salfit, two young men from Qalqilya’s eastern town of Azzoun, and another from al-Dhahriya town, south of al-Khalil. Ex-prisoner Saleh Shakarna was kidnapped by the IOF from his family home in Nahaleen. 14-year-old Palestinian child Khalaf Najajra was kidnapped by Israeli soldiers from the town shortly after they broke into his family home. Female ex-prisoner Fidaa Ikhleil, 23, was also kidnapped from al-Khalil’s northern town of Beit Ummar. Fierce clashes flared up in the area between Palestinian anti-occupation youth and Israeli patrols. At the same time, violent clashes rocked Salfit’s Old City after 12 heavily-armed Israeli patrols rolled into the area via its northern entrance and kidnapped the father of the Palestinian young man Muhanad al-Zeir, who has refused to turn himself in for the second day. The occupation forces attacked the locals with randomly-fired spates of rubber bullets. Meanwhile, the IOF stormed the home of the wheel-chaired Palestinian prisoner Adnan Hamarsha, in Jenin’s southwestern town of Yabad, and subjected the family to intensive physical search. Israel’s Prime Minister Benjamin Netanyahu on Tuesday threatened to respond with “great force” to a barrage of mortar shells fired from the Gaza Strip at neighboring Israeli settlements. “Israel views the attacks by Hamas and the Islamic Jihad from the Gaza Strip with great severity,” Netanyahu said following urgent security consultations held in the morning. 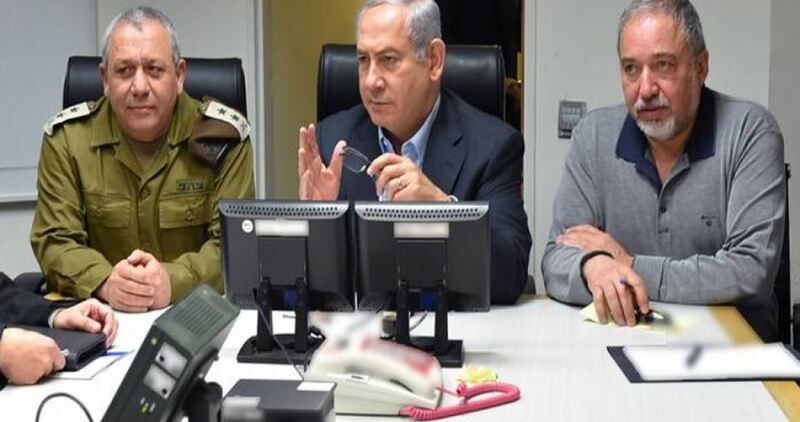 He stressed that the Israeli army will retaliate with great force to these attacks and that Israel will make anyone trying to harm it “pay a heavy price”, adding that Hamas should be responsible for preventing such attacks. Israel’s War Minister Avigdor Lieberman called a “special situational assessment” at the Ministry’s Tel Aviv headquarters with the army’s Chief of Staff Gadi Eisenkot and other senior figures from Israel’s security services. Observers expect that tension will run high in the Gaza Strip as Israel may strike targets in Gaza without generating into an open war similar to the one waged on the besieged area in the summer of 2014. The Israeli occupation army in a statement said that a barrage of at least 25 mortar shells was fired on Tuesday morning from the Gaza Strip at Israeli settlements, adding that most of the shells were intercepted by the Iron Dome missile defense system. In the past two days, 4 Palestinian resistance fighters were killed in Israeli artillery attacks on resistance posts in northern and southern Gaza. 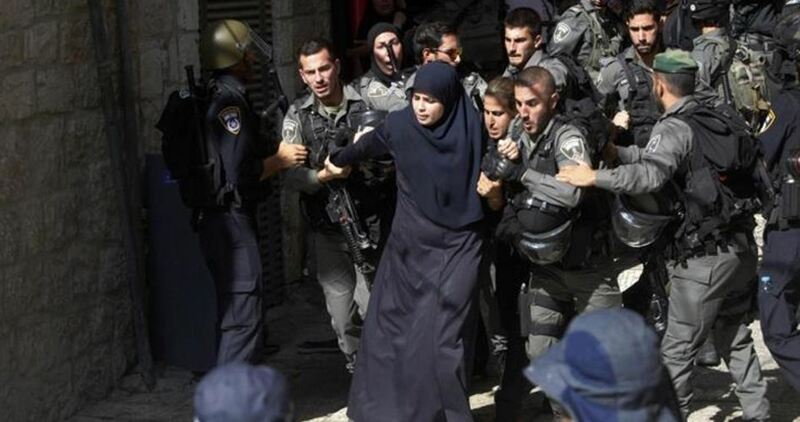 Israeli arrest campaigns targeting Palestinian women, including minors and university students, have notably escalated over the past few weeks, Anin al-Qaid Network said. Early on Tuesday, Israeli forces stormed Kafr al-Lubad town, in Tulkarem, and kidnapped the girl Alaa Fukaha from her family’s home. Their detention raised the female prisoners’ number in Israeli jails to more than 50 including injured and sick prisoners, the sources underlined. Anin al-Qaid Network called on human rights and women’s rights organization to intervene for the immediate release of Palestinian women and girls held in Israeli prisons amid very difficult detention condition. Israeli forces are still searching the area for the second Palestinian who fled the scene. GAZA CITY (Ma’an) — Israeli military planes carried out several airstrikes targeting military sites in the central Gaza Strip on Tuesday afternoon.Sources told Ma’an that Israeli planes launched seven missiles targeting an al-Quds Brigades site, the military wing of the Islamic Jihad movement.No fighters were at the site, and no injuries were reported. 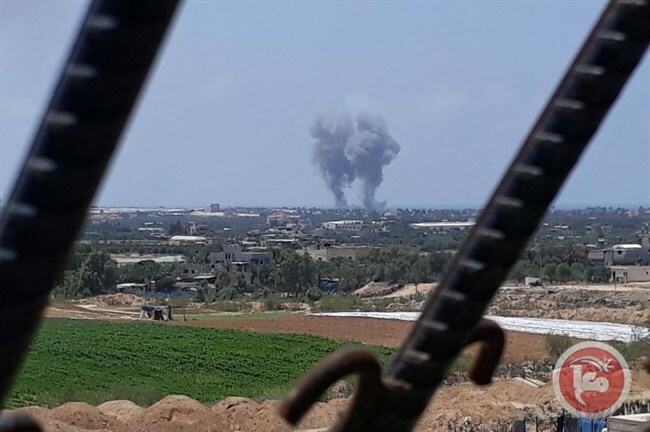 Material damages to the sites were reported.Another strike also targeted a site in Khan Younis in the southern Gaza Strip. The Israeli army said in a statement that Israeli planes targeted 30 sites in Gaza. Israeli news website Ynet reported that Israe’s Iron Dome missile defense system intercepted several rockets fire from Gaza into Israeli territory. Tensions have been high in Gaza over the past few days, as at least four Palestinian fighters from the Hamas and Islamic Jihad movement have been killed in Israeli airstrikes between Sunday and Monday. Israeli politicians waved through a bill that would limit Palestinians’ access to the High Court last night, according to the Jerusalem Post. The bill would prevent many cases, including those of housing demolitions and Israeli land grabbing offences, from reaching the High Court, instead redirecting them to district courts in the occupied West Bank. Right-wing politicians stated that the bill would reduce the number of complaints pertaining to land ownership that are often filed by Palestinians and left-wing organisations in the aftermath of settler occupation. Justice Minister Ayelet Shaked, a supporter of the bill, rejoiced in its passing of the first reading. Critics however argued that the bill was a step towards annexation of the West Bank, by expanding the power of district courts outside of Israeli sovereignty. Zionist Union MK Tzipi Livni expressed concern that the move would strengthen the argument that Palestinians should have the right to vote in Israel, as has been suggested as part of the one-state solution. Shaked defended the bill, stating that in the case of land ownership claims, it would place the burden of proof on the Palestinians filing the case, not the Israeli settlers. The bill will also refer other issues to the lower court, such as restraining orders and Israel entry permits. Israel has long sought to annex the occupied West Bank to preserve the illegal settlements in the area, but has struggled with what the fate of Palestinians would be. Earlier this month, Israel’s deputy defence minister, MK Rabbi Eli Ben-Dahan, claimed that Israel could annex the entirety of the occupied West Bank, without giving its Palestinian residents the right to vote. Morocco’s King Mohammed VI decided yesterday to send a medical team to the besieged Gaza Strip in order to provide medical treatment to the victims of the Great March of Return, following a request by the head of Hamas’ Political Bureau, Ismail Haniyeh. Haniyeh’s media office declared in a press statement that Moroccan Prime Minister Saadeddine Othmani had informed the Palestinian official of the King’s decision. Arrangements will be made with Egypt to ensure the medical team is able to enter the Strip, the statement added. More than 116 Palestinians were killed and more than 13,000 were injured during peaceful protests held near the Gaza-Israel border fence. Israel tested new weaponry on the protesters and inflicted severe injuries, with many demonstrators seeing their limbs amputated as a result. The United Nations High Commissioner for Refugees (UNHCR) in Jordan said as many as 85 per cent of the Syrian refugee families in Jordan live below the poverty line. A UNHCR spokesman in Jordan, Mohammed Al-Hawari said that 30,000 Syrian refugee families are threatened with aid cuts if the financial deficit being experience by the organization continues, noting that the Commission has provided only 28 per cent of the Syrian refugees’ response needs in the region during the first half of 2018. Al-Hawari explained that the UNHCR has estimated its need for cash assistance at about $6 million per month, equivalent to $250 for one family of five people. To reach its funding goals, the international body has launched a media campaign during the holy month of Ramadan to highlight the suffering of refugees in camps and beyond. Israeli occupation forced this morning arrested Suhoor-callers in the Old City of Jerusalem on the grounds that they were disturbing settlers in the area, according to the Palestinian Information Centre. 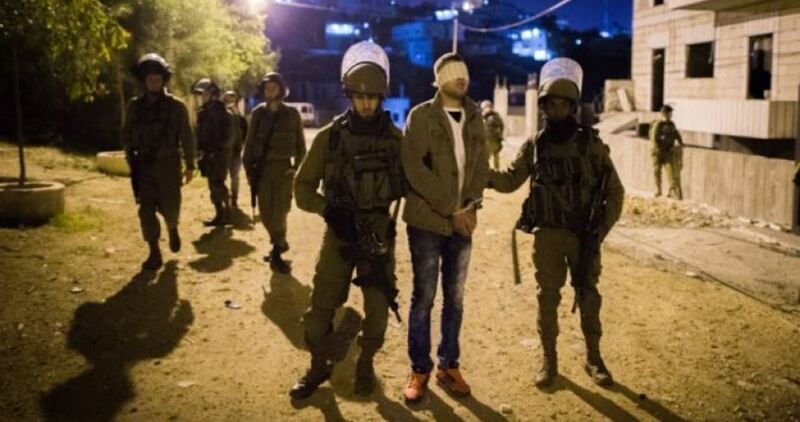 This arrests come within 24 hours of a number of detentions of Suhoor-callers in occupied Jerusalem. Suhoor-callers operate during the Muslim fasting month of Ramadan by walking through the streets pre-dawn to wake people up in order to eat their last meal of the day before the fast begins. This centuries-old tradition sees them beating on drums. Israel has repeatedly tried to eradicate Palestinian culture and tradition from Jerusalem in an effort to claim the city as its united capital. Many of Israel’s largest banks are providing financial services that help support, maintain and expand illegal settlements by funding their construction in the Israeli-occupied West Bank, Human Rights Watch (HRW) said in a report released Tuesday. According to the report, Israel’s seven largest banks provide numerous financial services to settlements. The report documents the involvement of many prominent Israeli banks in helping to build new housing units for preexisting settlements by acquiring property rights in occupied territory. “The transfer by the occupier of members of its civilian population into the occupied territory, and the deportation or transfer of members of the population of the territory are war crimes,” the report reads. 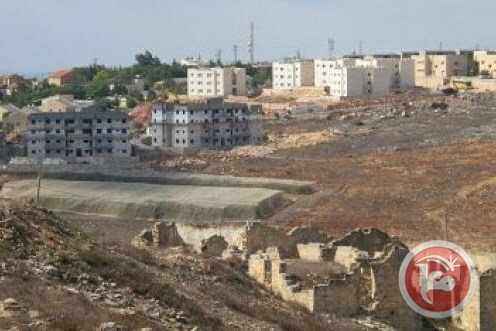 “By facilitating expansion of settlements, these banking activities facilitate unlawful population transfers,” it adds. Roughly 500,000 Israelis currently live on more than 100 Jewish-only settlements built since Israel occupied the West Bank and East Jerusalem in 1967. The Palestinians want these areas — along with the Gaza Strip — for a future Palestinian state. International law views the West Bank and East Jerusalem as “occupied territories” and considers all Jewish settlement-building activity on the land as illegal.